I received an ARC from Little, Brown Books for Young Readers. At first glance The Loose Ends List by Carrie Firestone doesn’t seem like an emotional story, but as you read you begin to see the deeper theme. 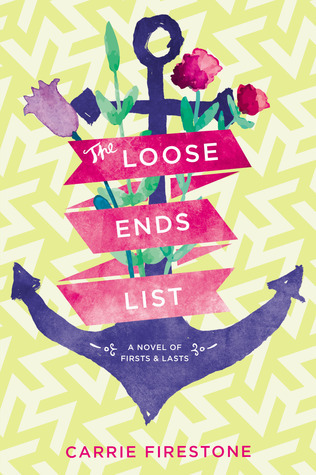 The Loose Ends List follows the story of Maddie O’Neill Levine, who had originally planned on spending her summer completing her “Loose Ends List” with her friends. But when Maddie receives devastating news she is swept away on a once in a lifetime vacation to help her grandma complete her own Loose Ends List. In this quote Gram explains the entire theme of the story. Despite the secrecy and heartache of the trip, Maddie finds herself stepping out of her comfort zone and even falling for a wonderful guy. With the help of her exuberant grandma and new friends, she learns to find beauty in all the little things and discovers what it is like to really live. I decided to make my own Loose Ends list just like Maddie! Read all of Jane Austen’s novels. Hang up all of my posters in my room. Get a job at Barnes & Noble. Finish making our ‘Victorious’ Music Video. Start a book merchandise store. They are not nearly as exciting as Maddie’s list but its a start! Carrie Firestone does a great job of making Maddie’s situation relatable. We all know somebody extremely lively and open-mouthed like Gram or outgoing like Janie. My grandma was in a similar situation and I totally understand how Maddie was feeling. Like Maddie I had a hard time accepting the facts at first. Reading about how she handled the situation was a relief. The book introduced some tension with the E’s and Rachel but never really resolved it or discussed it. To me endings make or break a book. The ending of this book left me wanting more. I feel like it could have been a little bit more complete. Nevertheless, it was a great read. The idea of traveling the world on a whim is a dream of mine and Carrie Firestone made it a reality. I’m deeply in love with the cover of this book and the overall concept. I highly recommend you go preorder this gorgeous book! Debuts on bookshelves near you on JUNE 7th, 2016! !